We know we’re a bit biased when we say this but, you’re going to want to get VIP tickets to this year’s Naperville Ale Fest. Why? It’s our best year ever. We’ve got special beer, a cushy shaded lounge area, VIP swag bags and more. Read on to see our top five reasons to go VIP at the Naperville Ale Fest besides, you know, the fact that you’re obviously very important and you should have the distinction to match. *Pro Tip: The VIP tickets tend to go quickly, so act fast! We were planning on saving this for last because it’s our favorite reason for going VIP… but we got too excited. Just like every year, our VIP area will include a special tap list of some of the hardest to find beers in the market. We can’t tell you what we’ve got lined up yet, but we promise it’s good. Like, really good. REALLY good. Let’s be realistic, none of us are as young and spry as we used to be and walking around all day can get tiring. Even the most practiced of beer fest vets need to take breaks. If you’ve got a VIP ticket, you’ve got access to our break worthy VIP area. Relax in the shade while taking in tunes from the private stage. Kick up your feet as you finish the remaining sips of your most recent beer discovery. Regain your strength and then, when you’re ready, get back at it. Each VIP ticket includes a food voucher that's redeemable at any of our 10 food trucks. They’ll be serving up everything from gourmet grilled cheeses to plates of sizzling hot doner kebab to Brazilian grilled meats. After all, the only thing better than having a tasty craft beer in one hand is having a delicious snack in the other. We love a good swag bag as much as the next person. That’s why we packed ours with a ton of VIP goodies, including a VIP tasting glass, exclusive t-shirt, VIP lanyard, and assorted gifts from our brewer friends. Because our VIPs are such… important people, we’re giving them access to the festival a whole hour before the crowds arrive. 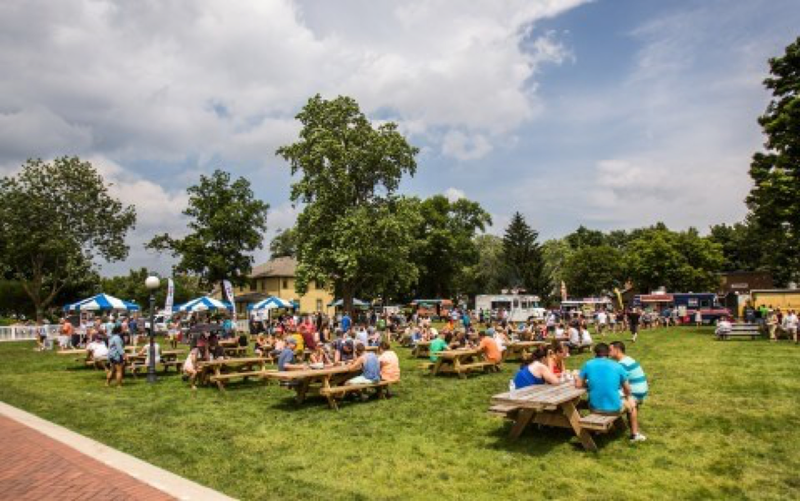 This means that not only will VIPs get unrestricted access to the brewers and they’re more sought after offerings, they’ll also be able to wander the 12 acres of the beautiful Naper Settlement before the party starts. A calm before the storm.